Bringing the Good News to the people we serve in Ethiopia is foundational to all we do. 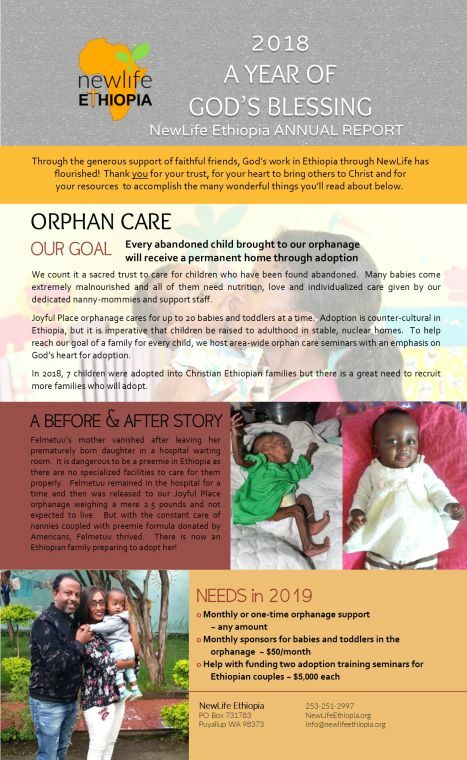 In addition to serving children with Jesus’ love in our orphanage and kindergarten, we are focusing on groups of Ethiopians who have never had an encounter with Jesus. Throughout Ethiopia there are pockets of people in the rural areas who have not been exposed to the Gospel of Christ. It is to several of these people groups that indigenous evangelists are sent to live among and be witnesses. Persevering through hardships and persecution, churches are being planted like never before and thousands have heard the gospel with many identifying with Jesus. Some of the most important aspects of NewLife Ethiopia’s work is done behind the scenes and the details cannot be communicated for security reasons. Seventeen indigenous missionaries deliberately moved to places in Ethiopia where the majority of people have not been reached, or minimally reached, with the Good News. Ten missionaries remained where they were after becoming Christ-followers in order to influence their town or village. All the men are former M*slim believers with a passion to reach their neighbors for Christ. God assigned these warriors to the front lines and they live uncomfortable lives in the trenches. Some have been severely beaten, threatened with eviction, their cattle poisoned, houses burned; they have minimal food and shelter and suffer under unfair practices of the local government. The missionaries and their wives give what little they have to their converts who face immense persecution, sometimes losing their jobs and homes because of their newfound belief in Christ. Most of the target villages are in out-of-the-way places with pedestrian or donkey cart paths and most travel is by foot. A village will be described as so many hours of walking from the nearest large town. Subsistence farming defines the economy and the stick and mud huts are scattered over a fairly large geographical area. The missionaries are supplied with rugged bicycles so they can pedal across the arid savanna. Many places have no electricity, and water is hauled from a water station either on the backs of women or children or on a donkey. Cooking is over an open fire and some women collect firewood to barter for food. Village life is tribal in nature and relationships hold a place of high value. The missionaries are from the same tribe as the people being reached and, of course, speak the native language and understand the customs and culture. The first step for an evangelist is to develop friendships and be a good neighbor. Sharing about Jesus will naturally flow out of relationship and the missionary has written materials that bring further clarity and answer common questions. House meetings are arranged to disciple new converts and provide fellowship. When there are 15-20 believers in an area, then a traditional church building needs to be considered to accommodate the numbers and encourage growth. Audio Bibles are supplied to the churches so people who cannot read can come to the church and listen to the Word. 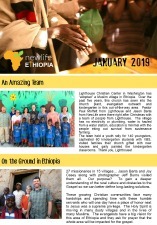 NewLife Ethiopia partners with 36 indigenous evangelists in Ethiopia to bring the gospel to pockets of unreached or least reached people groups. These dedicated men and their families live and work in hostile environments with very limited resources.